I love photographing children at weddings. The always gave me the right expressions ranging from funny faces to teary eyes. 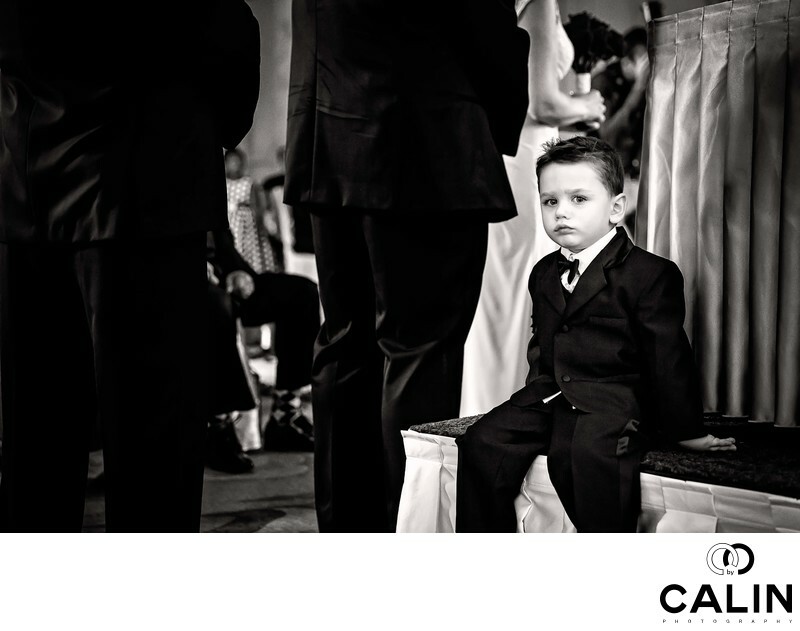 Or, in case of this young boy I photographed at a King Edward wedding, an upset face. Boys are usually known for their discontent with the rules of regulations of a wedding day. During the wedding ceremony that took place in the Sovereign Ballroom, I noticed the bride's nephew sitting behind the bride and groom where nobody could see him. The ceremony was obvious to long for him and he couldn't wait for it to be over. His face is so unhappy that is almost hilarious. From composition standpoint, the boy, the obvious subject in this image is placed along the baroque diagonal along the right vertical line created by the intersection of the diagonal and the reciprocal line. I shot this image at the very shallow depth of field (f2) with my Canon 85 mm lens to provide separation between the subject and the background. The brunette boy is also sitting in front of one of the bridesmaids wearing a light dress, which increases the figure to ground contrast. Because this is a candid image, I chose a black and white processing and added some film grain after I dodged and burnt the image. Visit King Edward Weddings Website to find more information on how to book events and a list of packages offered by the beautiful hotel.